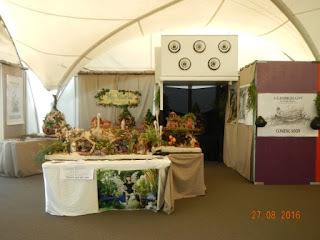 Well this year I was given such a large area that I was able to put Pebble Cottage together only for the second time in the eleven years I have been displaying my models at this show. I was also able to promote my up and comming story - A Gribbles Gift. The art work for the posters was by Aaron Pocock. This only the second time in eleven years that Pebble Cottage has been displayed in its entirety. Hanging house on the left is Veeleeta's and the one on the right is Grigwell's. All are made from gourds. This little girl was having her photo taken with one of my fairies for the Gold Coast Bulletin Newspaper. Two of the posters illustrated by Aaron Pocock for the fantasy story I have written about the characters who live in the hanging houses I have made using gourds.